I was living in Congo when the name and flag of the country changed. An MPR flag (Mobutu's only allowed party) already existed. It had the same flag as what became the Zaire flag, but without the yellow circle: thus green with an arm holding a torch with a red flame. And that stayed the flag of the party. As long as the unique party remained, the cockade worn by its members was that same design : the torch on a green background, on an oval little jewel made of copper. For dignitaries, it was better carved, and protected by transparent plastic. Lots of books, reviews or papers from the Mobutu period also wore that sign : a green band with the arm and the torch. I cannot imagine where the so called "party flag" designed by Mr Martins according to Mr. Bliss has been found or fancied. If that design has something in common with Mobutu and his party, then the only period it could be related to is the period 1965 - 1967, when he founded an organization called CVR (Corps des Volontaire de la Republique = Corps of Republican Volunteers). 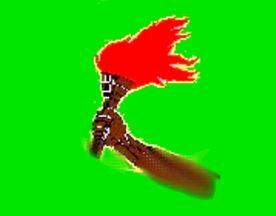 But the green and torch flag appeared in the same time as the "Manifeste de la N'sele", at the foundation of the MPR party. (N'sele is the name of a village, where Mobutu gathered number of politicians to elaborate that manifest). That is the real MPR party flag : the same as the former national one, but without the yellow circle and with a bigger arm. This flag existed BEFORE the Zaire flag. The National Alliance's Party for Unity (Parti de l'Alliance Nationale pour l'Unité) is a centrist political party in the Democratic Republic of the Congo, founded in 2003. It has 190 candidates for the upcoming parliamentary elections in July 2006 and has decided to support President Kabila in the forthcominh presidential elections (see http://en.wikipedia.org/wiki/National_Alliance_Party_for_Unity). - the "bonne gouvernance" (good governing) is "a series of rules and practices which give hope to our Republic and our citizens and determination to our youth". "All members of the RCD who would act again the "bonne gouvernance" will be sacked. 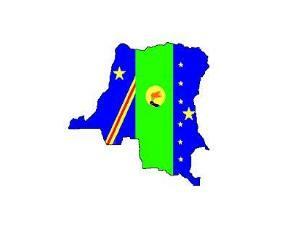 My question here is what really is this flag, because is surely not Mobutu’s party flag. Not only it has no resemblance to the Zaire flag, but also it features a map of Zaire / Congo-Kinshasa without the southern secessionist provinces of Katanga/Shaba, Southern Kasai and what seems to be part of Kivu, something Mobutu would never had endorsed.